If cleaning companies are to be believed you need a different chemical product for every single cleaning job in the bathroom. But this couldn’t be further from the truth. In fact you can clean your bathroom using everyday items and materials found around the house. Here are amazing cleaning hacks to make your bathroom sparkle, provided by Mike James and the Bathroom Discount Centre. Cleaning the bathroom mirror doesn’t always go as planned. How many times have you used some sort of cleaning agent that leaves marks on the mirror? Yes, there are chemicals that work, but you actually already have a brilliant natural mirror cleaner in your home: tea. The tannic acid in tea works perfectly on mirrors. So brew some tea (don’t add milk!) then use a clean cloth and wipe the mirror. It will be clean and free from smudges or marks. Some people clean their toilet with bleach or some other nasty chemicals. Of course, they do the trick, but what can you do if there’s no bleach in the house or you don’t want to risk getting anything nasty on your skin? It’s easy – mix together vinegar and baking soda then simply pour around the bowl, the way you would be bleach. Let the mixture rest there for a few minutes and flush for a clean and sparkling toilet. Once again, when most people think of cleaning the bath, they reach for chemicals. Of course you are running the risk that the residue from these chemicals will be left in the tub the next time you run your bath. 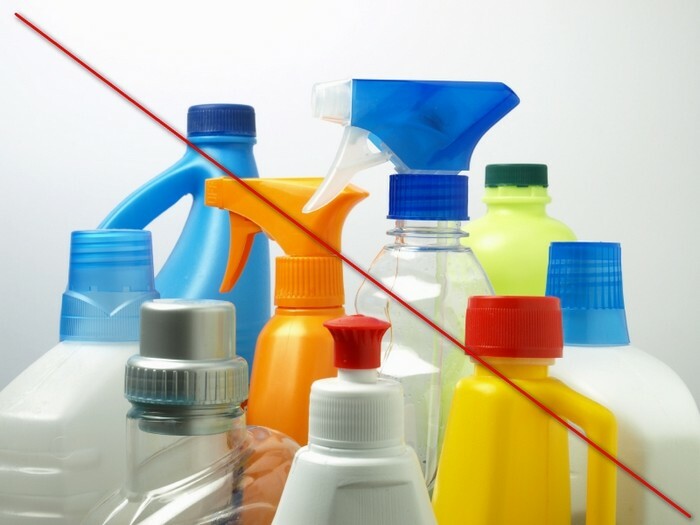 It’s a much better idea to use completely safe and natural cleaning products. The first thing to do is take a grapefruit and cut it in half. 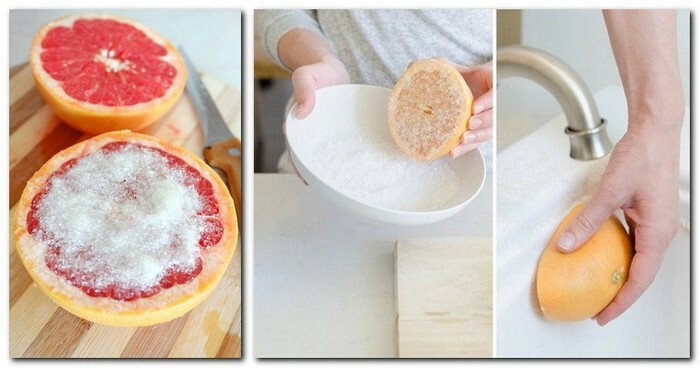 Now apply salt crystals to the grapefruit half and use it to scrub around the bath. Once you’ve gone over in thoroughly you can leave it for a couple of minutes before rinsing. This will keep you bath entirely clean and smelling fresh. You may have started to notice that your shower head is not pumping out water the same way that it used to. For some, the water flow may be reduced by a build-up or it could be that the water jets out in a strange direction. Either way, this can be solved with a little trick that works wonders on your shower head. Fill a sandwich bag with vinegar and place the bag over the shower head. Now tie top of the bag to the shower head using an elastic band. Leave it soak for twenty minutes or so and then you shower head will be working perfectly again. There are a couple of great ways to clean your shower door or anywhere that soap scum or grime builds up. The first thing you can try is non-stick cooking spray – it might sound ridiculous but it lifts scum off the surface easily. If you don’t have any cooking spray in the house you could opt for a dryer sheet. Wet the dryer sheet first and then use it as you would a cleaning wipe. It’s incredible how the marks and stains simply lift off in seconds. Looking for a way to make your taps gleam? There are a couple of different everyday items that do the job perfectly without having to resort to expensive and nasty chemicals. Your first option is shaving cream. Cover the taps in the cream and leave for a minute or so before wiping it away with a damp cloth. If you don’t have any shaving cream then a drop of baby oil will do wonders as well. Here we’re back to our old friend vinegar. Pour a solution of equal parts vinegar and water into a spray bottle. You can then use this to spray the tile as and the grout. Let the mixture dry completely before rinsing it with clean water. For tough stains, you may need to repeat this a couple of times and you could even use the solution to scrub the marks with an old toothbrush.